Diana, with a barely alive Clark in her arms, has raced to meet her Olympian family of Artemis, Strife, Eros, Hermes and Hephaestus seeking their help. Strife is reluctant to help, viewing Superman as beneath them. Hades steps from the shadows seeing an opportunity and offers Clark a lifeline. 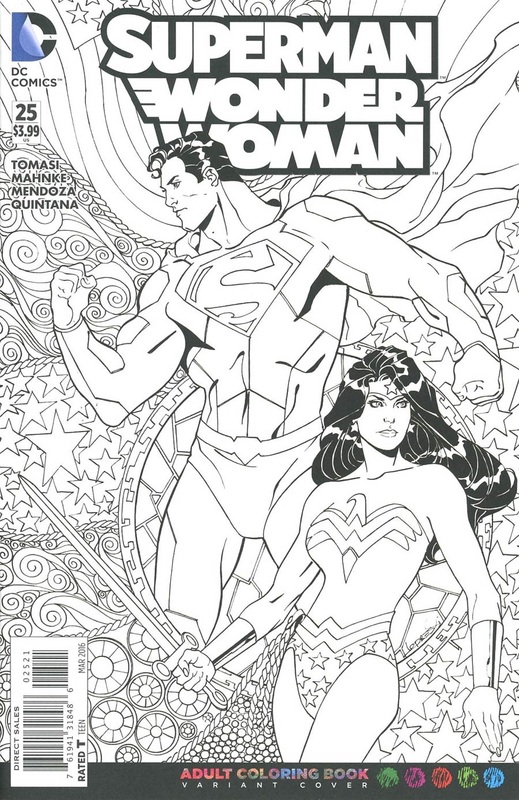 The gods question both the relationship of Clark & Diana and his worth of their gift of healing. Hades proposes a test of valor and if his spiritual form should pass their tests, he will be healed. Artemis leads a spiritual Superman in his costume into the depths of a forest instructing him they are on the hunt. Splitting up in a cornfield Superman chases his prey as it races through the crops but as they hurtle out into the open Superman is stunned to see his prey is Clark Kent. Artemis is impressed with Superman's tracking skills and throws a spear at Clark to kill him, Superman intercepts and they are both impaled before hurtling into a waterfall. Later when emerging on a bank in Kansas, Clark and Superman have merged into a composite man and meet Strife. Strife parades Clark through the streets of his hometown and while he remains silent, the townsfolk bombard him with bottles, bricks and litter. Strife is impressed with his fortitude and switches the locale to Metropolis where she introduces him to yet more abuse, disgust and hatred. Still Superman remains calm, so Strife ups the ante by leading him into the Daily Planet. Superman refuses to respond to the hatred despite Strife's attempts otherwise and suddenly composite Superman is face to face with Hephaestus under Mount Etna. Clark asks what hellish trial the blacksmith god has in store for him and he is shocked when instead the god offers him a way to avoid hate, fear and anger by leaving earth... in a custom built space craft, destination unknown but a clean slate nonetheless. Mount Etna begins to erupt, a time for fight or flight for Clark... Clark stands firm and is swallowed up by lava. As quick as a flash, Composite Superman is now walking through a garden littered with romantic statues of Clark & Diana, his host on this occasion is Eros. Clark asks to leave, the depictions of his relationship proving difficult to bear. Eros however is dismissive of Clark's feelings and opinions he starts smashing the statues and angrily points out they have both created false dramas and blocks in their relationship to ensure they couldn't progress. Clark has a desire in his heart and he is using emotional roadblocks to stop it. Eros litters Clark's torso with bullets and he falls back into a fountain heaving for breath. Clark examines his wounds and finds Martha's engagement ring. He remembers putting it back in the dresser on the farm and Eros points out mentally, deep in his heart, he never locked it away. Eros asks him to make a choice, free his desire or bury it. Clark stands firm again and refuses to reveal his heart's choice. Suddenly Clark's spiritual form is back in his body and the gods all turn to Hades to confirm he passed all of their tests. They have made him a completely human mortal. Story - 5: Beautifully written. 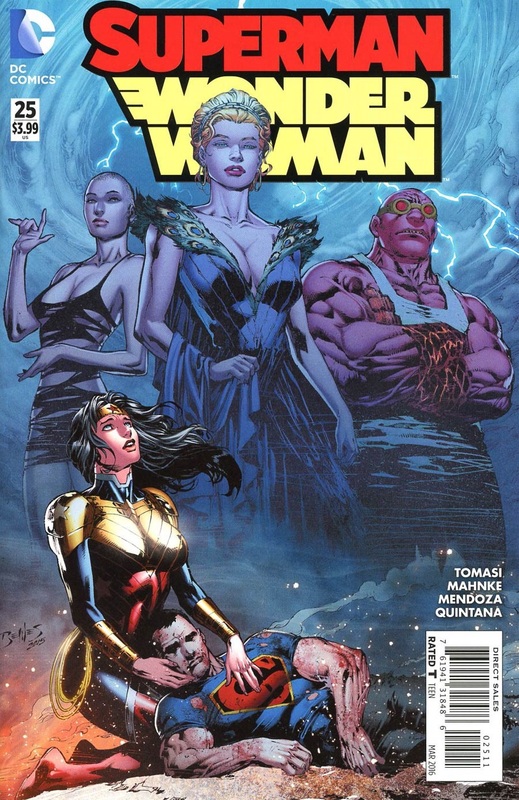 Superman & Wonder Woman rarely mix their continuities, with one or the other appearing as a mere cameo or as a guest star, so this issue was a good way of blending their 'families' and what an issue. With Greg Pak concentrating on driving the main storyline, Yang doing... something he's being paid for, it is great to see Tomasi take on the reigns of the dramatic. It strongly follows on from the Annual and that engagement ring... and brings Clark closer to his possible extended family. Yes, they all offered bizarre, physically painful and heart wrenching choices but each opened up Clark to us and things he's been tormented by for months. His internal struggles have been a source of frustration in the books since 'Truth' began because he kept everything secret. So it was nice to see some of the dirty laundry finally aired. It also showed us the man Clark is deep inside, despite some of his storylines, deep down he is still a man of steel. In some ways this story made me think of Mxy... Just like deals of old myth, Diana's deal with her family has some unexpected consequences, both for her, for Clark and their future. Art - 5: Just like the writing I have to say I'm blown away with the art this month. I loved every page, perhaps I'm still reeling from the Annual, but this issue continued the style and emotion I've grown to love from the book. If I were to give one critique it would be that some clear transitions between trials would have been an enhancement. Cover Art - 4: All the ingredients are there though Hera is present front and centre for some bizarre reason. The art is good but the emotion isn't there. Remember, Clark is 'straddling life and death' so Diana doesn't seem so much desperate as a bit down. None of the gods seem in character either, they look like them but with no personality. Variant Cover Art - 5: I haven't been gripped by the adult coloring phase gripping the world but I'll admit I thought this was pretty cool and I am definitely tempted to give it a go! If you have done, please show us!